February 3, 2018 / NationalTeamsOfIceHockey / Comments Off on A Japanese Hockey Prodigy Eyes a Path to the N.H.L. At 14, Aito Iguchi is already an internet stickhandling sensation and a household name in Japanese youth hockey. The question wherever he plays is typically not whether, but when, he will stickhandle his way to a goal. But Iguchi wants more than goals. “I want to set my sights on being a pro hockey player,” he said, quietly but firmly, after collecting three goals and three assists during an 8-5 win in Karuizawa, a town about an hour northwest by bullet train from his home in the Tokyo suburbs. Top men’s hockey prospects from Japan primarily hope to play for the country’s top universities or club teams, veteran coaches say. Some have played in the now-defunct Japan Ice Hockey League or a newer outfit, the Asia League, whose eight teams are based in Japan, Russia and South Korea. But today, more of Japan’s top teenage players are eyeing youth, collegiate and professional leagues in North America. That includes Iguchi, who already plays part of the year in British Columbia and said he hoped to return to Canada to play in the Greater Toronto Hockey League, a proving ground for N.H.L. prospects. 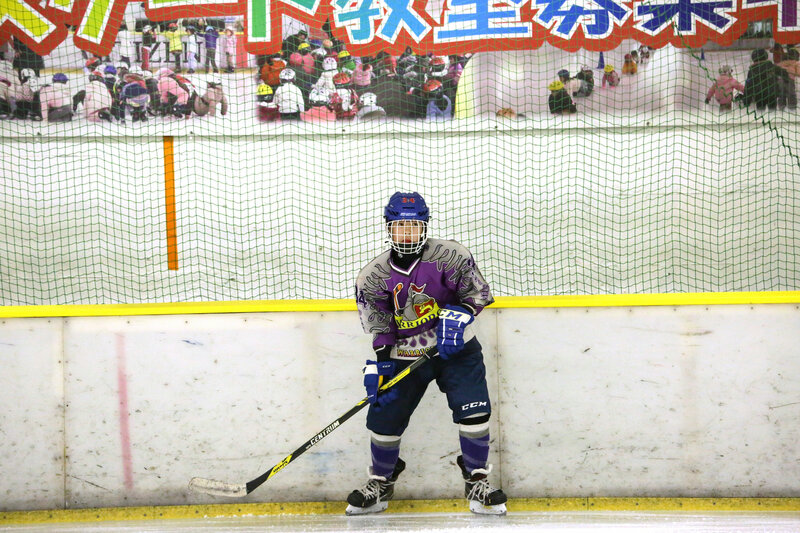 Ice hockey’s profile is rising in Asia with the Winter Olympics in South Korea next week and in China in 2022. Several Japanese women play at the sport’s highest professional level, including the goaltender Nana Fujimoto, a star of the national team who played last season for the New York Riveters of the National Women’s Hockey League. Several other Japanese players are on rosters in the Canadian Women’s Hockey League. But even though Japanese-Canadian players, including the Hall of Famer Paul Kariya, have played in the N.H.L., players who grew up in Japan have struggled to break in. Yutaka Fukufuji, the only one who ever has, appeared in only four games for the Los Angeles Kings during the 2006-7 season. Triple Alpha is a family adviser for several Japanese players who Mihara said aspire to change that paradigm. He said the standouts include two N.C.A.A. freshmen: Lake Superior State’s Yuki Miura and the University of New Hampshire’s Kohei Sato. Along with Lunasa Sano, a freshman on the Harvard women’s team, Mihara said, they are the first Japanese-born players to play N.C.A.A. Division I hockey. Ikki Kogawa, 14, a former teammate of Iguchi’s, plays for the Toronto Marlboros of the Greater Toronto Hockey League. The team’s alumni include the N.H.L. stars Rick Nash, John Tavares and Connor McDavid. Many of Japan’s top teenage players are from the northern island of Hokkaido and play for elite youth teams there. But Iguchi and Kogawa are two of five teenage players who grew up playing in Saitama, north of Tokyo, and now play for AAA youth teams in Canada and Russia. Graham said he and a fellow Saitama-based coach, the former Russian Olympian Vasily Pervukhin, began taking their players to overseas tournaments and exhibition games several years ago to expose them to a higher level of competition. He said that in Canada, the boys were pleasantly surprised by how much hockey pervades daily life — unlike in Japan, where it is overshadowed by judo, baseball and soccer. “That kind of got the ball rolling and peaked their motivation to look above and beyond Japan to further their ice hockey aspirations,” Graham said. Iguchi still lives in Japan, but he has played two seasons of spring AAA hockey with the Langley Rivermen, outside Vancouver, and he won or tied for the scoring titles at several elite youth tournaments in Canada and the United States. Graham said that Iguchi was comfortable playing against Canadian opponents, who tend to be far more physical than Japanese teams. Iguchi is being wooed by several hockey academies in British Columbia and may try out for the Greater Toronto league, Graham said. By 2019, he would be draft-eligible for one of the three Canadian major junior leagues that are springboards to professional hockey. His father, Kazuhito Iguchi, a civil engineer, said that cost was a consideration and that his son would also consider playing in Japan or the United States. Mihara, who does not advise Iguchi on hockey matters, said that Canadian hockey academies typically cost the equivalent of at least $31,000 a year, and that Canadian boarding schools could cost nearly $43,000. “Even for a rich family, that’s still a lot of money,” he said. Doug Christiansen, the director of player development and recruitment for the United States Hockey League, the top junior league in America, said Iguchi would be among the 200 elite youth players invited to a league showcase in April. Unlike the Japanese women’s national team, the country’s men’s team did not quality for 2018 Winter Olympics. But with help from today’s top teenage prospects, Christiansen said he expected the men to be competitive in qualifying for the 2022 and 2026 Games — on par with countries like Austria, Denmark and France , which have each produced about a dozen N.H.L. players and been in the top division in the world rankings. “They’re going to have some really, really strong teams,” he said. During the recent game in Karuizawa, Iguchi, an elegant skater, seemed at turns to be taking it easy: stickhandling circles around his opponents with the puck, as a cat-owner might tease kittens with a ball of string, before picking his corners for shots. Iguchi said later that when he was learning to play, he had been inspired by Pavel Datsyuk, a Russian stickhandling wizard and longtime Detroit Red Wings star, who now plays in the Kontinental Hockey League. “He can deke and stickhandle like no one else,” Iguchi said. Graham said that Iguchi’s own agility and stickhandling skills were remarkable for a player his age, but that a key question was whether he could continue to develop his already considerable speed. But in person, Iguchi is unassuming and seems ambivalent about being the center of attention. During an interview after his recent six-point game in Karuizawa, he politely fielded questions with the detachment of a teenager sitting through an algebra class or a dental appointment. His gaze was drifting toward the ice.